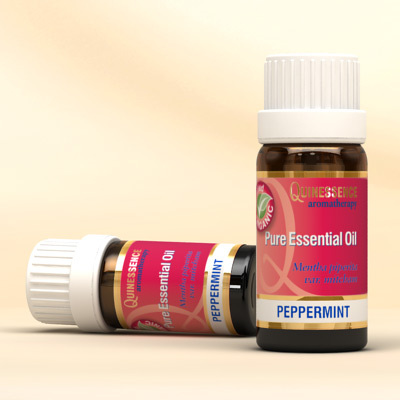 When inhaled, the reviving aroma of Organic Peppermint Essential Oil relieves the symptoms of travel sickness, nausea, jet lag and general fatigue, whilst in massage it is particularly helpful with digestive disorders such as indigestion, cramps, vomiting and diarrhoea. It works effectively with emotional states too, such as mental exhaustion, impatience, indecision, irritability, poor memory, shock, and improves mental clarity or lack of concentration. Just a few drops of Organic Peppermint Essential Oil in a footbath can cool, soothe and refresh tired, aching feet in a way that absolutely nothing else natural can! It’s a great muscle relaxant that soothes away general muscular aches and pains and stiff joints, which is why it is valued so highly in sports massage therapy. Its antiseptic, anti-infectious and cleansing qualities bring relief to colds, flu and catarrhal congestion, whilst its stimulating action helps overcome general fatigue and burn-out.